Background: Paclitaxel (PTX) is a potent anticancer drug which is highly effective against several cancers. Solid lipid nanoparticles (SLNs) loaded with anticancer drugs can enhance its toxicity against tumor cells at low concentrations. Objective: To develop and characterize SLNs of PTX (PSLN) to enhance its toxicity against cancerous cells. Method: The solubility of PTX was screened in various lipids. 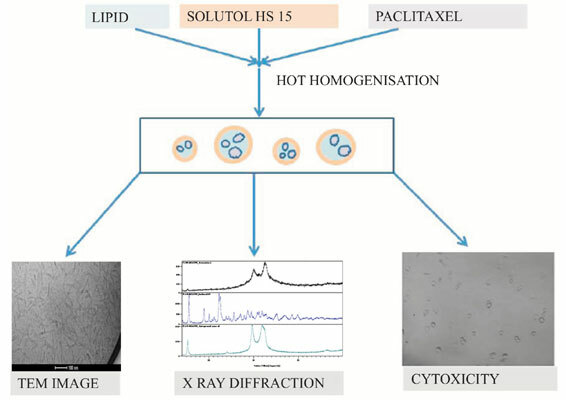 Solid lipid nanoparticles of PTX (PSLN) were developed by hot homogenization method using Cutina HR and Gelucire 44/14 as lipid carriers and Solutol HS 15 as a surfactant. PSLNs were characterized for size, morphology, zeta potential, entrapment efficiency, physical state of the drug and in vitro release profile in 7.4 pH phosphate buffer saline (PBS). The ability of PTX to enhance toxicity towards cancerous cells was tested by performing cytoxicity assay in MCF7 cell line. Results: Solubility studies of PTX in lipids indicated better solubility when Cutina HR and Gelucire 44/14 were used. PSLNs were found to possess a neutral zeta potential with a size range of 155.4 ± 10.7 nm to 641.9 ± 4.2 nm. In vitro release studies showed a sustained release profile for PSLN over a period of 48 hours. SLNs loaded with PTX were found to be more toxic in killing MCF7 cells at a lower concentration than the free PTX. Paclitaxel, solid lipid nanoparticles, cutina HR, gelucire 44/14, solutol HS 15, solubility.